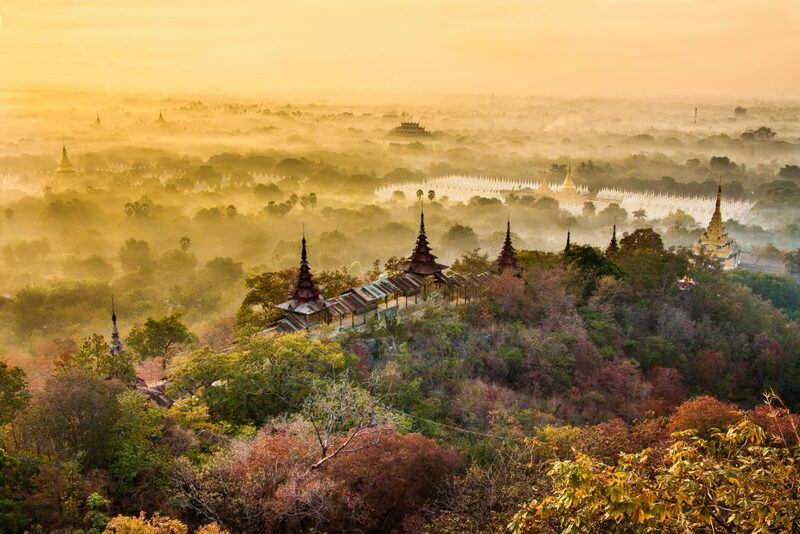 Burma is one of those countries which seem to have been favored by nature. Its soil is rich, producing rice and other food crops in abundance. There are vast forests containing a large variety of trees from which valuable timber is extracted. The ground yields petroleum and many minerals and precious stones including rubies, sapphires and jade. 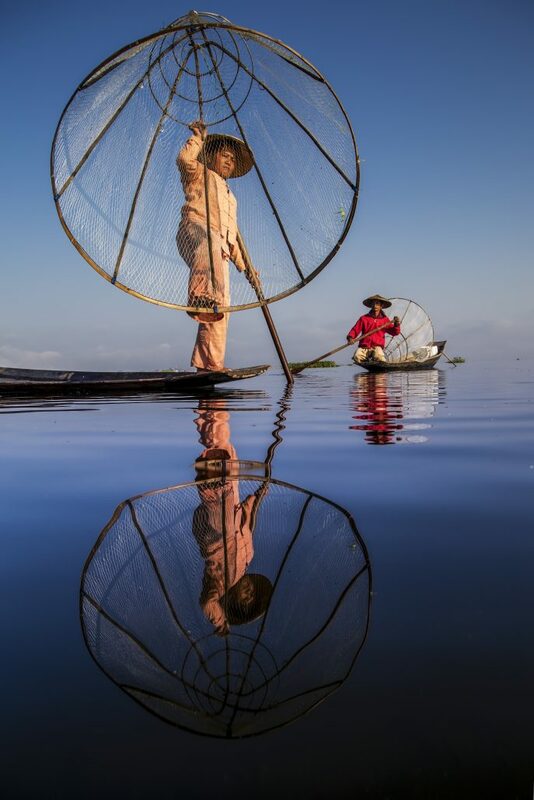 The rivers and streams are full of fish; and from the sea along Burma’s coastline come not just seafood but some of the world’s loveliest pearls. 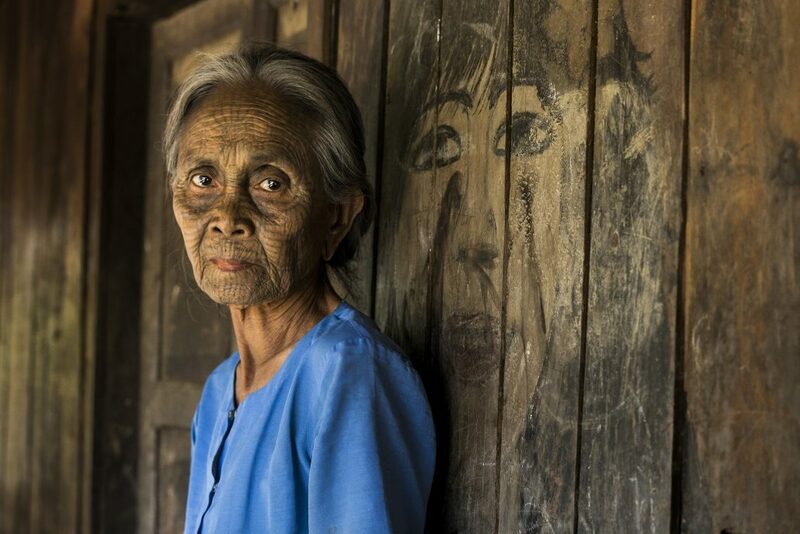 Burma has been described as a golden land, an eastern paradise of untold riches. 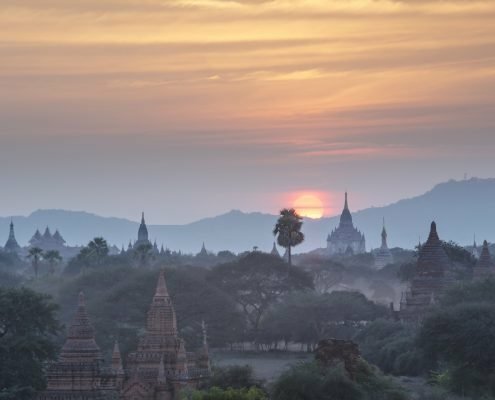 But of course, no country on earth is a real paradise and, for all its natural wealth, Burma is not among the rich nations of the world today. 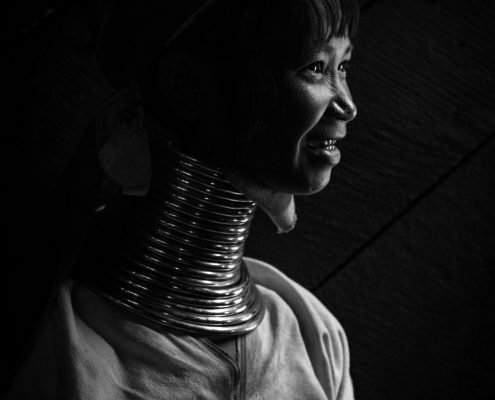 It is nevertheless an extremely beautiful country peopled by many different races. 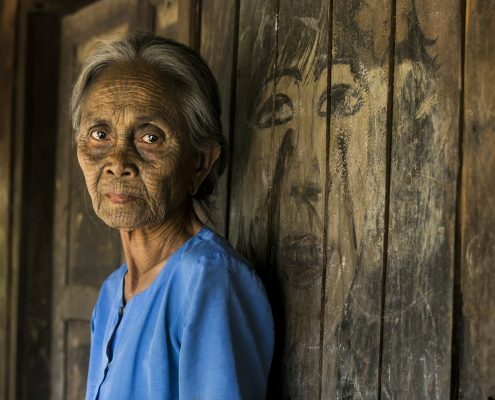 It is from the Burmese people, who form the biggest racial group, that the name of the country is derived. 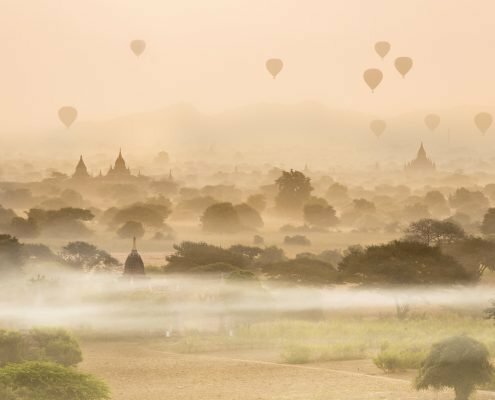 Myanmar : formerly known as Burma, remains one of the most mysterious and undiscovered destinations in the world and we welcome you to the golden land of pagodas, breathtaking natural beauties with friendly people of different ethnics. 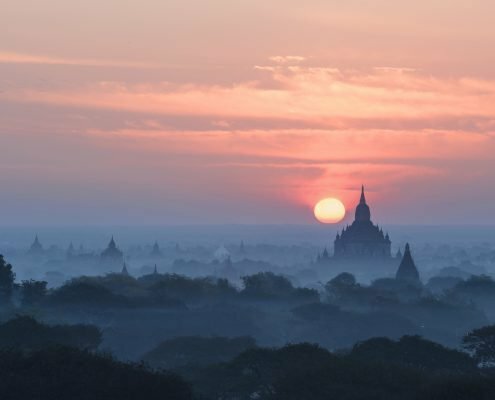 Myanmar has been forgotten and closed its door in self-isolation and now it reopens to the outside world, revealing its unique, unspoiled culture and beautiful natures to the visitors. 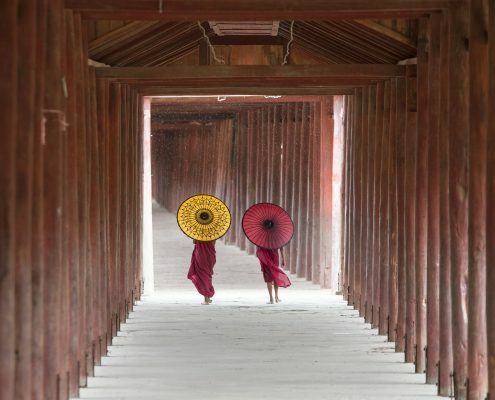 Myanmar has something to offer at all times of the year with a wide diversities of anthropology composed with many ethnic groups, different topography or terrain that ranges from snow-capped mountains in the north, to the pagodas studded plains in the center, beautiful white sand beaches along the western coast and virgin islands in the south to be explored and discovered. Day 1 (Oct/30) Arrive Yangon before 1 p.m. 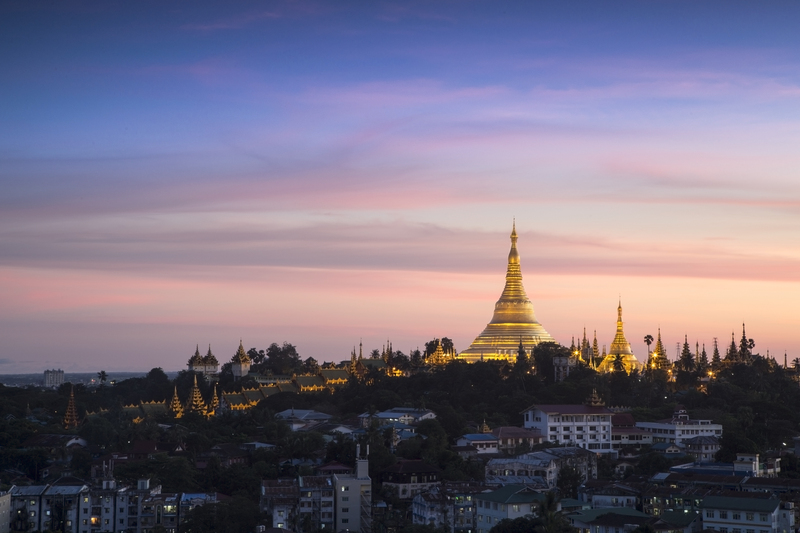 Upon arrival, you will be transferred to start the city tour from the downtown area, where you can take street photos of the combination of colonial and modern Yangon. After walking around the downtown area for about 1 hour, have lunch on own account. After lunch, visit 70 meter long reclining Buddha Statue of Chauk Htat Gyi pagoda. After that, get on our minibus and proceed to the most magnificent, landmark, glory of Yangon and the most sacred of all Myanmar Buddhist people Shwedagon pagoda which stands 326 ft (99.4m) on the Singuttara Hill. The legend says and the people strongly believe that the eight strands of the Buddha’s hair were enshrined inside the pagoda 2500 years ago. Then, we can go to Kandawgyi Park for the sunset with Shwedagon Pagoda background. After breakfast at the hotel, transfer to the airport to fly to Sittwe. 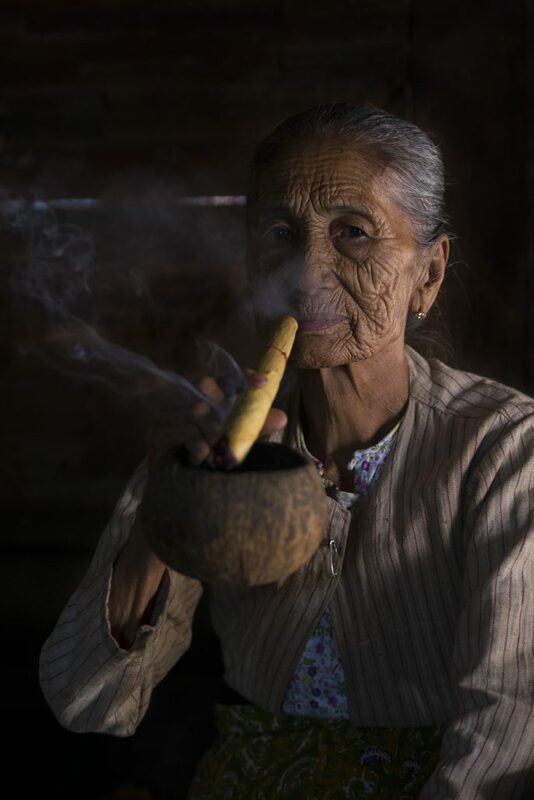 Upon arrival, have lunch in Sittwe and take a cruise to Mrauk U for about 5 hours. (by private car for about 3.5 hours) Check in hotel and relax. ( 1 ) Shittaung pagoda, “temple of the 80,000 images of the Buddha” referring to the number of Buddha images contained in it, built in 1535 by King Min Bin to commemorate the success of a military campaign. ( 2 ) Htukkanthein temple, a bunker like Buddhist temple built in 1571, As the very massive structure is built on raised ground, has a dark interior and a long spiralling corridor leading to the inner chamber with small windows and just a single entrance, it is believed that the Htukkanthein served as a place of refuge during times of war. 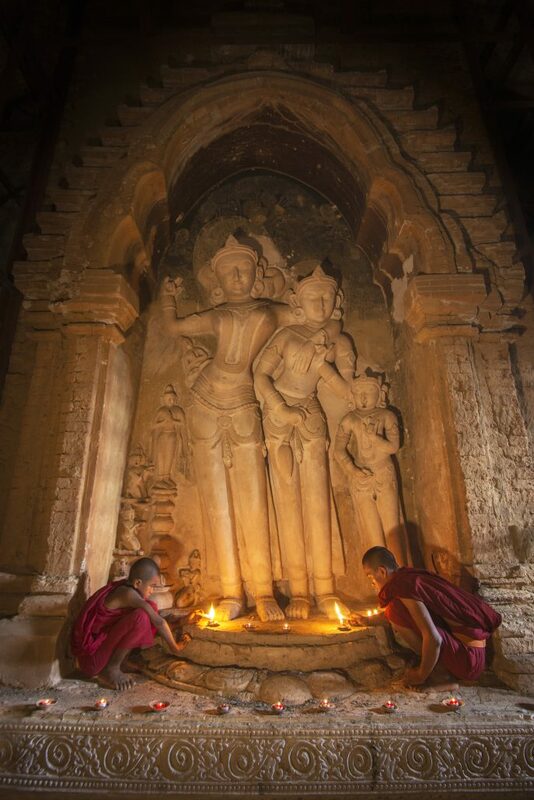 (3) Koethaung temple, means “shrine of the 90,000 images of the Buddha”, referring to the number of Buddha images. (4) Andawthein temple, A tooth relic of the Buddha is said to be enshrined at the Andaw temple (constructed in 1598), which features a prayer hall on its eastern side from which you can enter the temple itself. 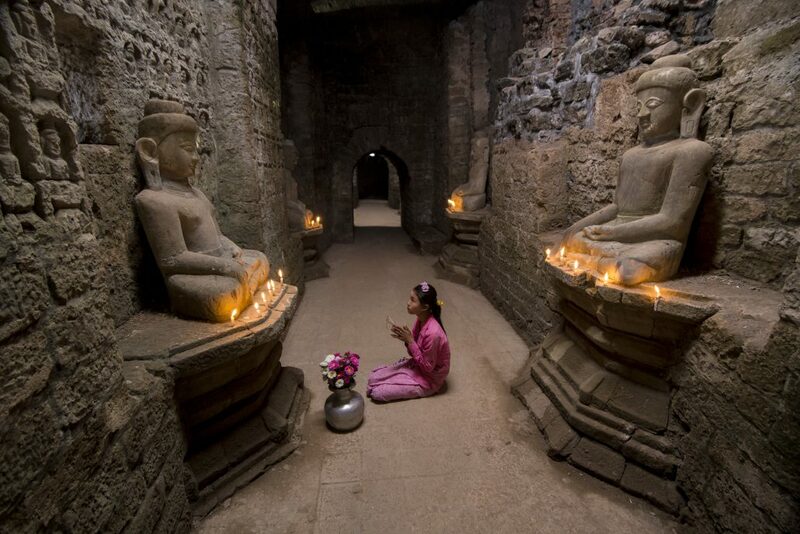 Inside you will find a central Buddha and circular vault with a number of stone Buddhas. After breakfast, you will be transferred to the Sayoh jetty for the boat trip to Chin villages along “Lay Myo River” to take portrait photos and observe the way of life of the Chin ethnic people whose women traditionally wear tattoos on their faces in Sin Gay village and other villages like Checkchaung, Ale, Nyaungbin and Sinte. Return to Maruk U. 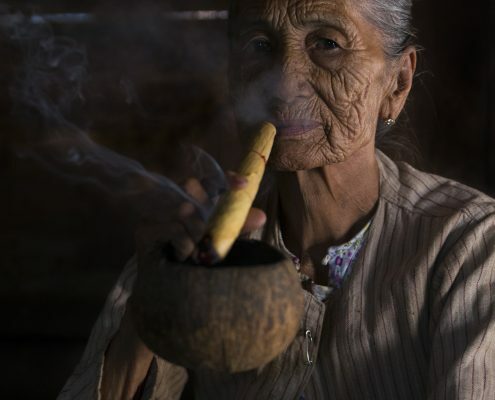 Another day in the “Lost city” of Mrauk U to explore and take amazing photos. After breakfast at hotel, you will be transferred to the jetty to take a boat trip (or Road Trip) back to Sittwe. Have lunch in Sittwe and check in the airport to fly back to Yangon. Check in hotel in Yangon and take relax. 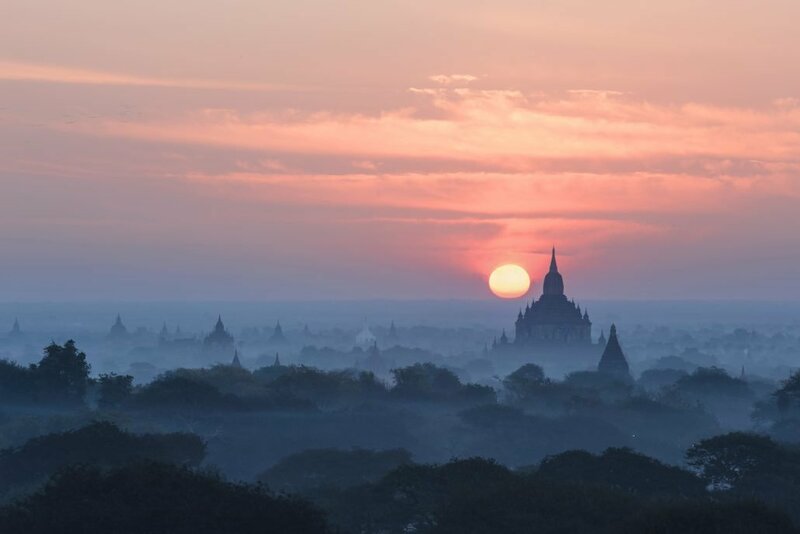 After breakfast at the hotel, you will be transferred to the airport to fly to Nyaung U and Bagan where has 11th to 13th centuries 2217 monuments left of original four thousand seem to overwhelm the landscape of 16 square miles or 26 square kilometers on the Eastern bank of Ayeyarwaddy River. Upon arrival at the airport, transfer to the hotel and start sightseeing include Ananda temple which is the most beautiful, finest, perfectly proportioned and the crowning achievement of the Early Style of temple architecture built by King Kyansittha in 1090, Shwezigon which was built by Anawrattha but not completed and King Kyansittha terminated completion of the structure in 1089. 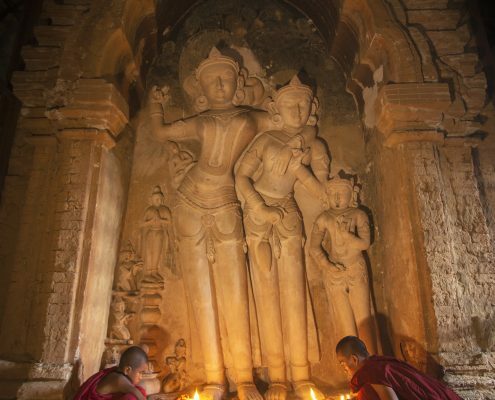 The architecture of Shwezigon is the prototype of later Myanmar stupas. It used to be the home for 37 Nats or Spirits erected on the lower terraces of the pagoda, but now they are housed in a small hall separately in the pagoda compound. 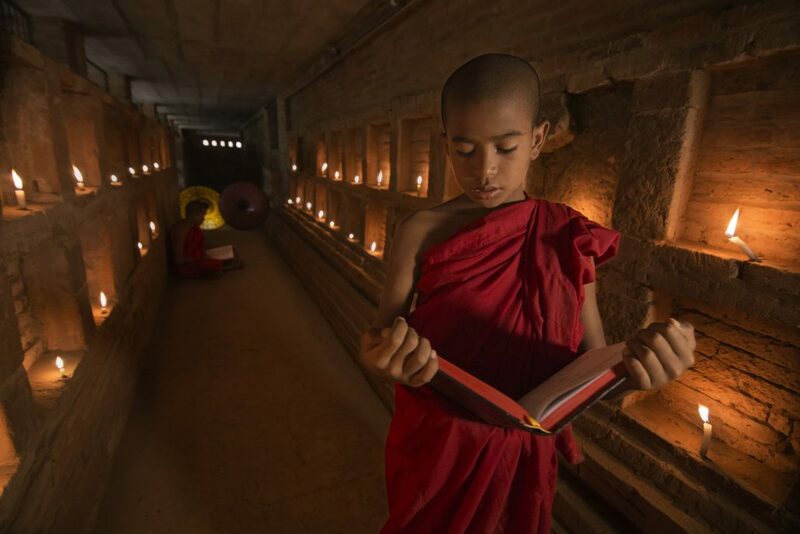 After lunch on your own account, go for set up photo shooting with the monks in the low light temples. Sunset from the pagoda. Get up early around 4:30 AM for sunrise shooting from the pagoda. 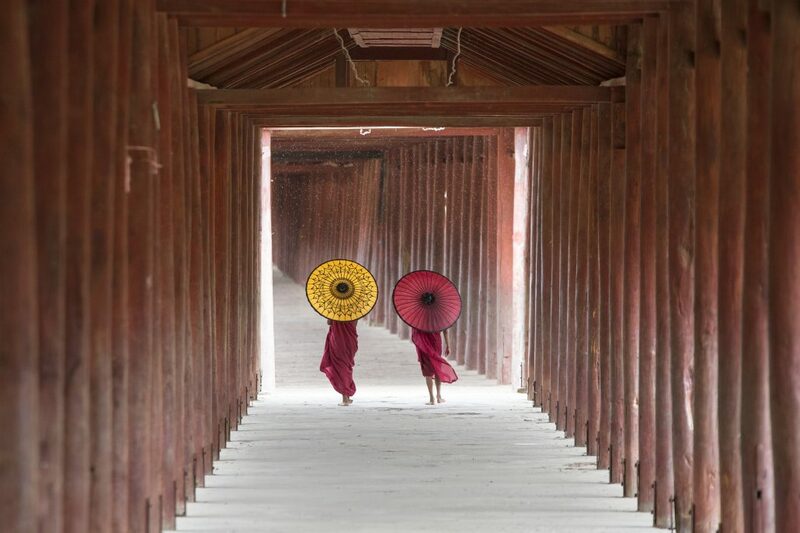 After sunrise, proceed to Shwezigon Pagoda Corridor for light and shadow photos, then go back to hotel for Breakfast. 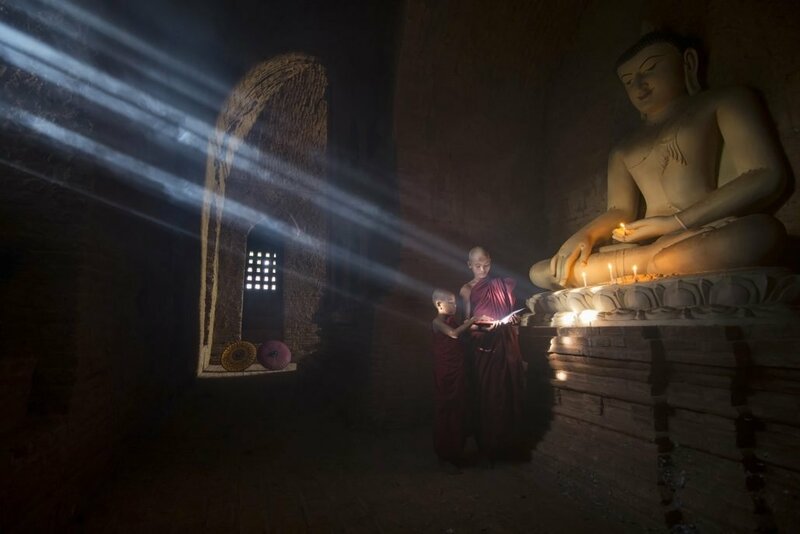 At your convenient, you start your sightseeing includes Nanpaya; the 11th century temple which is one the three pagodas at Bagan where sand stone was widely used together with bricks. It used to be the Hindu temple with the finest and impressive features stone relief carvings of the Hindu deities, Brahma and pendant floral designs or pilasters on the pillars. 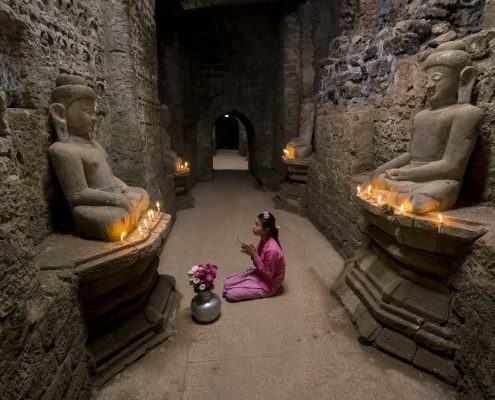 The stone carving is the reminiscent or remaining of the techniques of Java or Cambodia, curved from not a single slab but from stone blocks that interlock and it was never to be repeated again in Myanmar. 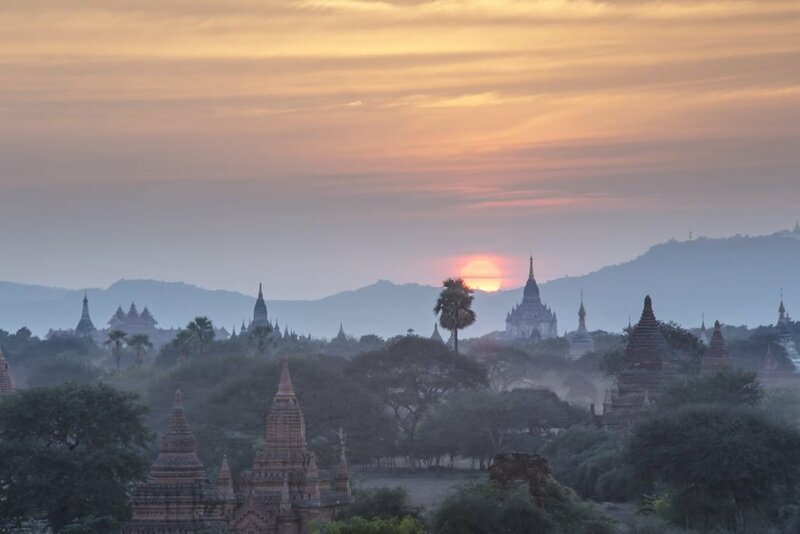 Other sightseeing includes Dhamayangyi temple; 12th century pyramid look-alike temple is the biggest and the most massive one visible from everywhere of Bagan, Htilominlo Temple, where one can observe very fine plaster carving still remain on the arch pediments, frieze and pilasters.Sunset from the pagoda. Get up early around 4:30 AM for sunrise shooting from the pagoda. After sunrise, go back to hotel for breakfast. 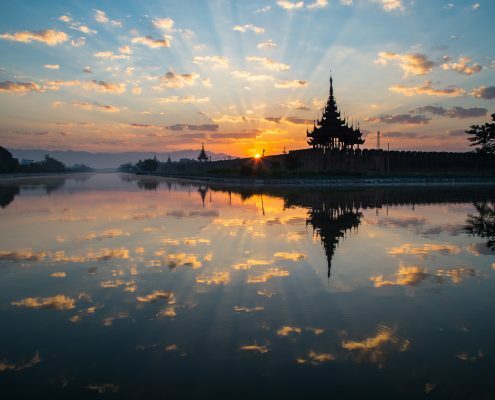 After breakfast at the hotel, you will be transferred to Nyaung U airport to fly to Mandalay. 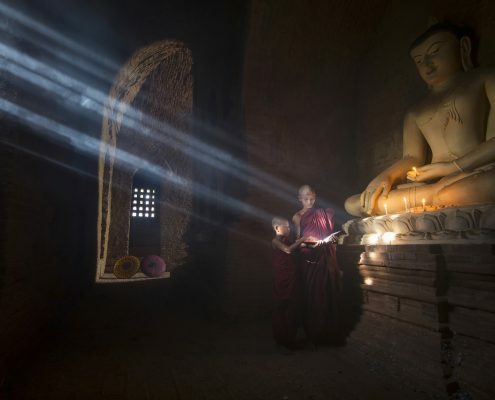 Visit the Stone Curving area where people make Buddha Status in various size. 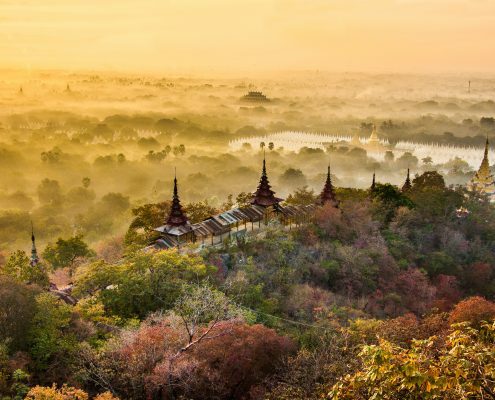 Check in hotel and at your convenience, explore this fascinating city; such as Kuthodaw Pagoda, Shwenandaw Monastery, , Mahamuni Image and gold leaf making workshop to observe how to make the thin sheet of gold left in traditional ways for all religious monuments and statues around the country. Enjoy the sunset from U Bein Wooden Bridge. 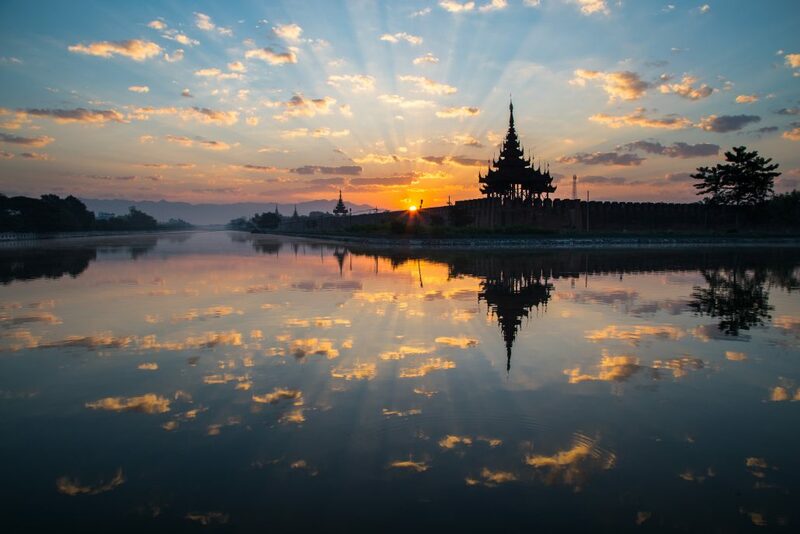 Get up early around 5:30 AM for sunrise in Mandalay Palace or Mandalay Hill or U Bein Wooden Bridge. After breakfast at the hotel, take a road trip to Sagaing, visit MyaSetkyar Monastery where you can see lines of Buddhist monks queue for lunch what is their last meal of the day. 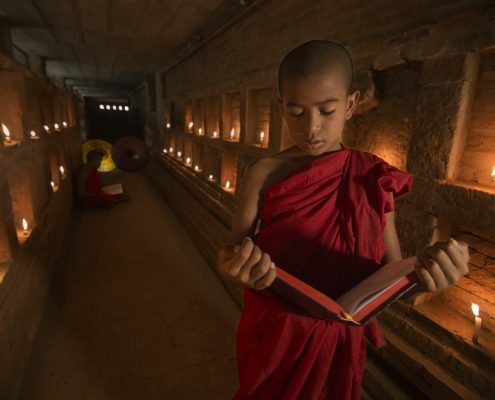 After that, visit monastic school where the monks and volunteers taking care free education for the poor and orphans. Having Lunch at local restaurant and after that, proceed to Mingun.We will set up for photoshooting in Mingun Pagoda, unfinished pagoda which might have been the biggest pagoda in the history of Buddhism, and Myatheindan Pagoda.You can also observe Mingun bell, the world largest ringing bell.Drive back to Mandalay, and if time permit, sunset in Shwe Ket Kya pagoda on the river bank. After breakfast at the hotel, you will be transferred to the airport to fly to Heho. 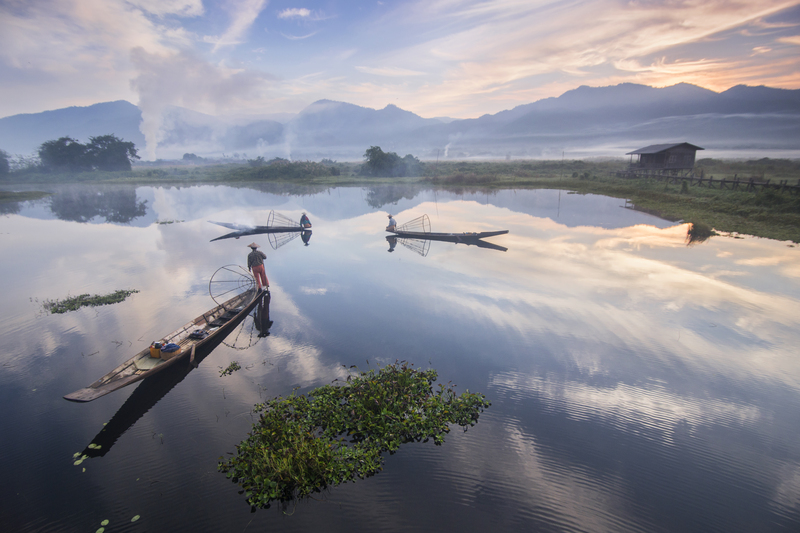 Upon arrival at Heho airport, take a road trip to Nyaung Shwe where is the gateway to Inle lake. Check in hotel and start your sightseeing by boat in Inle Lake, including the local 5-day-markets, Phaung Daw U pagoda, Innpawkone village which is well known for silk and lotus weaving, visit Floating Gardens where the local Innthar people grow vegetables like tomatoes, beans, etc for the living. Lunch in the local restaurant on own account. Come back to the hotel for sunset photo shooting with fishermen set up. Before breakfast at the hotel, sunrise staged photo shooting with the fishermen. Have breakfast and visit the local market (only on market days). 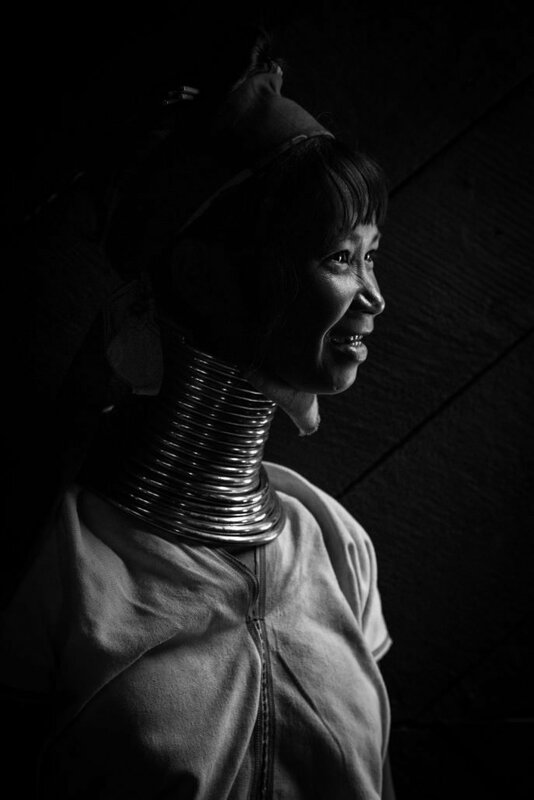 Visit Ywa Ma viallge to take portrait photos of long-neck ladies (aka) Padaung tribes. In the afternoon, boat trip to the western shore of the lake along a narrow beautiful creek to get to Inn Dein pagoda complex where houses over 1000 small Shan style pagodas of unknown dated. 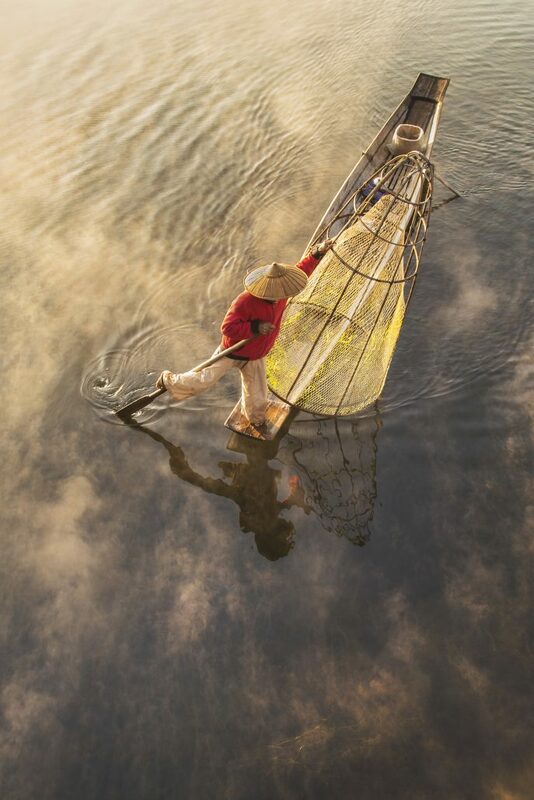 Come back to the hotel for sunset photo shooting with fishermen set up. Before breakfast at the hotel, you will be transferred to Nyaung Shwe, and then by car to Heho Airport to fly back to Yangon. Arrive Yangon, check in hotel and at your convenient time, go to the central railway station to take a city train ride for street photos. The trains are old fashioned, diesel engine locomotive and simple coaches. After the city train ride, you will be picked up at a station and visit the night market of Yangon. After breakfast at the hotel, depart the hotel for your international flights. Any flight after 10 a.m.
Full list of recommended wear will be sent to participants. I consider Baikal lake as top place for photographers from all over the world. 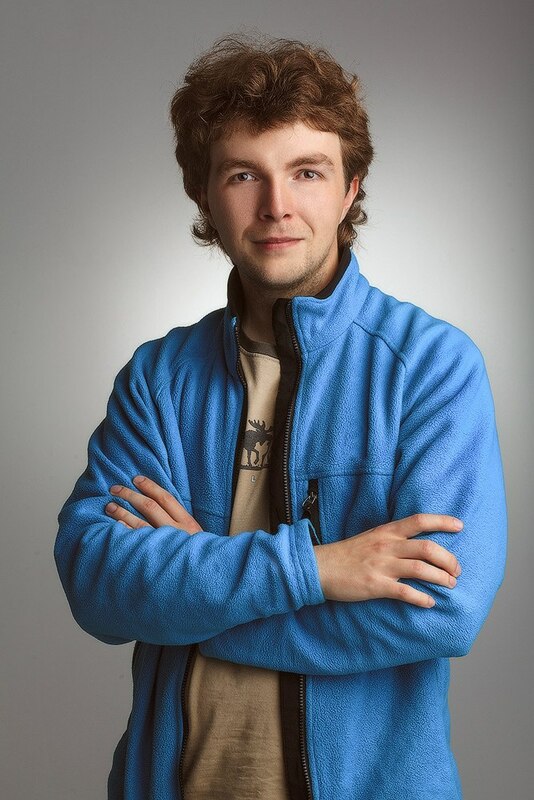 I will help you to reveal its beauty. 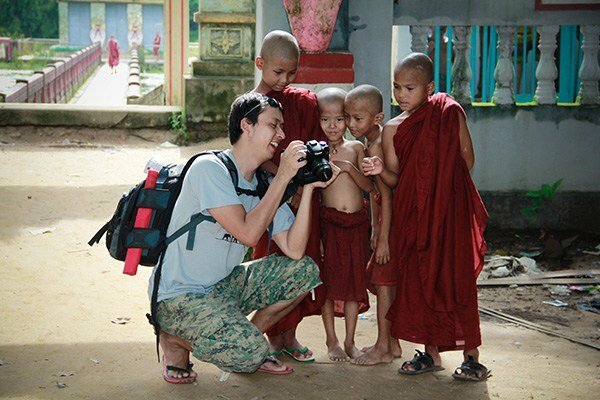 Khun Phyo has been participating in Myanmar Tourism business for more than 10 years as a freelance tourist and photo guide. Together with his energetic friends, Khun founded Broadway Myanmar Travels. 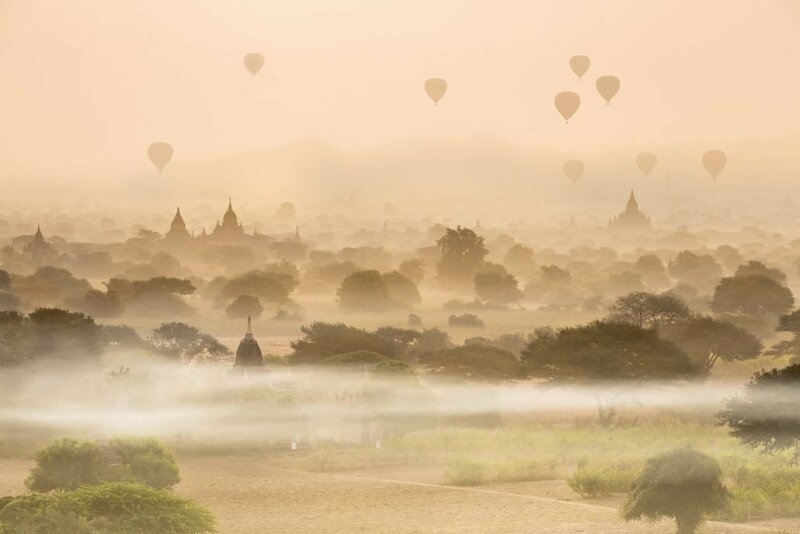 They all have the same passion and mission to be a part of promoting the development of tourism in Myanmar Tourism and of related local communities by means of participating in social welfare, educating them in environmental conservations.